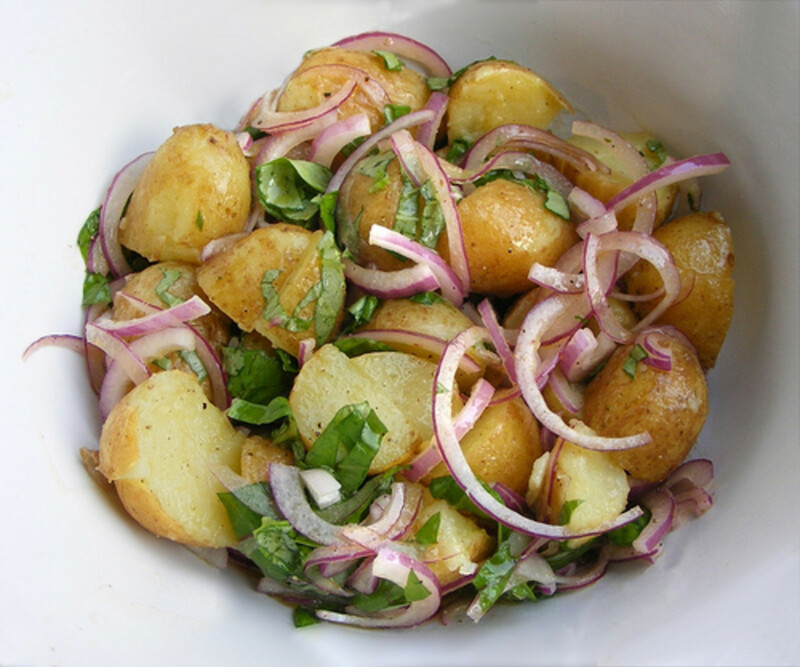 Potatoes can be a very exciting side dish. The dishes featured here are my favorites and they have always received rave reviews from my dinner guests. Since I'm often asked how they're made, I've decided to share the recipes here. The great thing about these dishes, and the reason they're my favorite recipes, is that they are all simple to make and taste delicious. 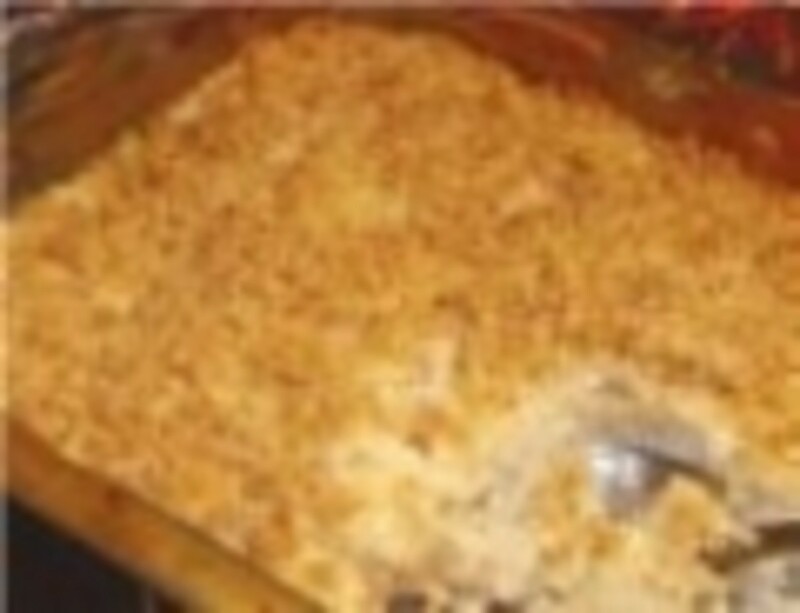 This is an easy dish that takes a little while to cook but is very easy to prepare. 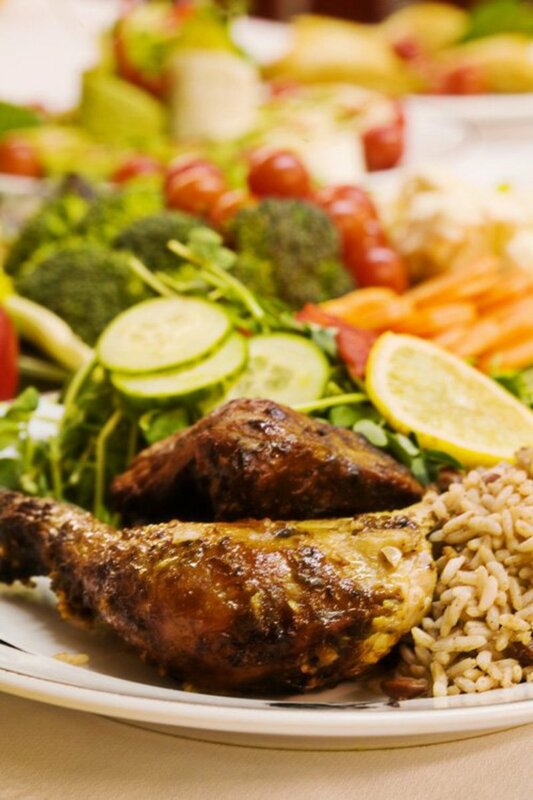 It goes well with nearly any type of main course and tastes great reheated, too, so don't be afraid to double or triple the recipe. Also, try doubling the recipe by making it with one baking potato and one sweet potato! Preheat the oven to 375 degrees F. Cut the potato into half-inch chunks and put them into a microwave-and-oven-safe bowl, and microwave the potato pieces for three minutes. 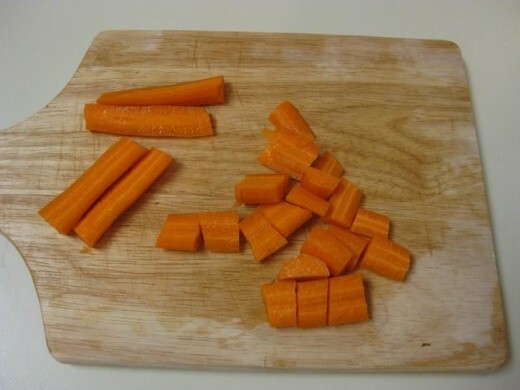 Meanwhile, chop the carrots, first slicing them in half and then cutting into half-inch chunks. 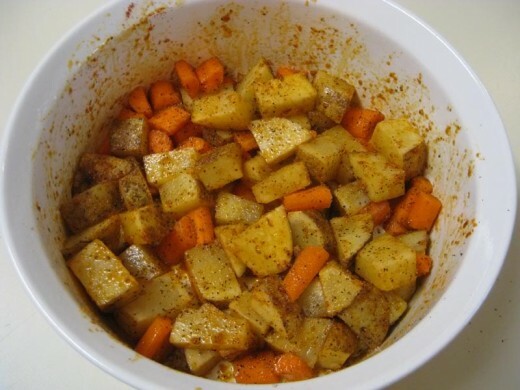 Put the carrots into the bowl with the potatoes and add five or six tablespoons of olive oil. Then sprinkle a generous layer of salt, pepper, garlic powder and paprika over the top of the mixture, and just a couple dashes of the chili powder. Mix it well, making sure every piece is coated in olive oil and seasoning. Bake for 40 or 45 minutes, stirring halfway through cooking. 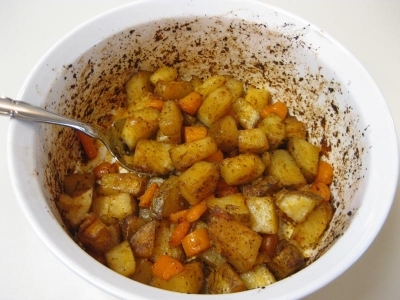 The potatoes should be done when they're browned around the edges and they're easily poked through with a fork. Do you need the metric measurements? Try this website for conversions. 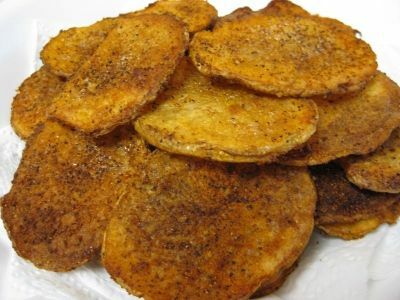 These homemade potato chips (or crisps) are easy, delicious, and one of my favorite side dishes. I suggest using two potatoes if you're feeding four, but for these photos I've only used one potato. I used to use regular extra virgin olive oil to make them, but found that this always left me struggling with scraping stuck-on potato pieces off my pan and so I switched to a non-stick spray that is made with real olive oil. The spray tastes almost as nice, but it's much, much easier to clean up afterwards and I lose no potato slices to a stuck-on mess, so it's worth it for me. Preheat the oven to 375 degrees F and spray a large cookie sheet (with sides) generously with the non-stick spray. 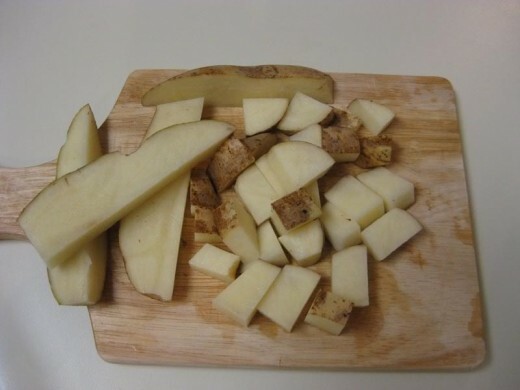 Slice the potato thinly, about an eight-inch thick and arrange the pieces on the cookie sheet, spreading them out. 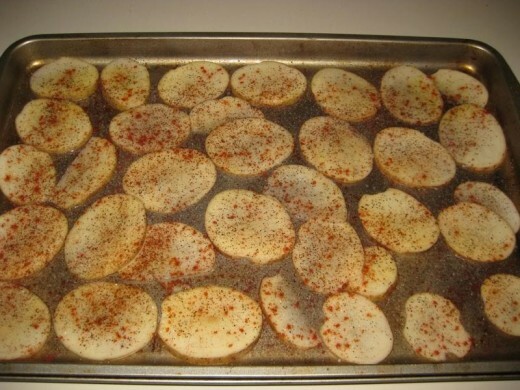 Spray the potato pieces with the non-stick spray and then generously sprinkle them with all the spices. Flip each piece over and sprinkle them with the spices on that side, too. Bake them for 30 to 45 minutes (it will take longer the thicker the slices are). They are done when the slices are brown and crispy around the edges. Serve them in a bowl lined with a paper towel. Do Potatoes Make a Great Side Dish? No way. Potatoes are boring! When we lived in Germany, we loved ordering potatoes like this with our schnitzel, but this side dish goes well with many things. My lovely friend Samantha taught me how to make these delicious potatoes and was even kind enough to supply me with some Bratkartoffel Spice, though after the recipe I'll show you how to make your own. 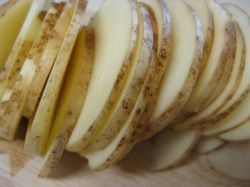 Peel the potatoes and then cook them until they are fork-tender, either by boiling them on the stovetop or in the microwave. I boil them in the microwave, which takes about 15-20 minutes. The potatoes should be cooked through and you should be able to easy slide the fork into them, but they shouldn't be mushy. 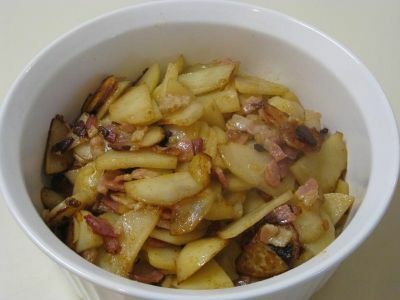 While the potatoes are cooking, dice the onion and bacon slices. 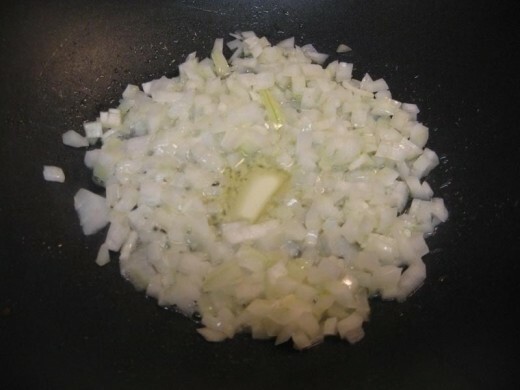 Melt the butter in a large frying pan or wok, then add in the onions and let them cook for a couple minutes. Then add the bacon and let it brown. 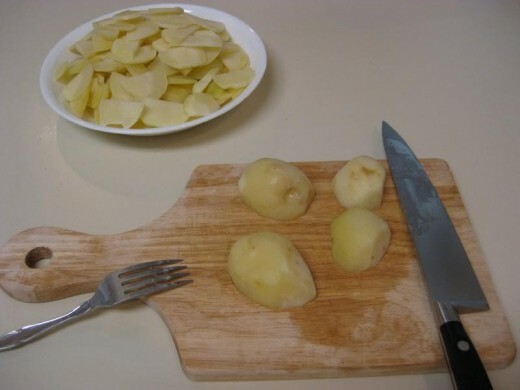 Meanwhile, slice the cooked potatoes by first cutting them in half (or quarters if they're very big) and then slicing them into 1/8 inch slices. 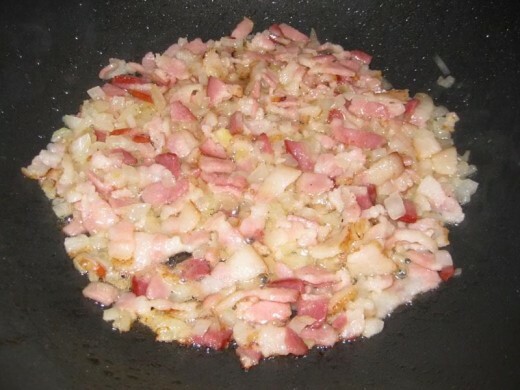 Once the bacon is browned and the onions are clear, add the potato slices to the pan and generously sprinkle the spices over them. Mix well. Feel free to add more butter if the potatoes look dry. 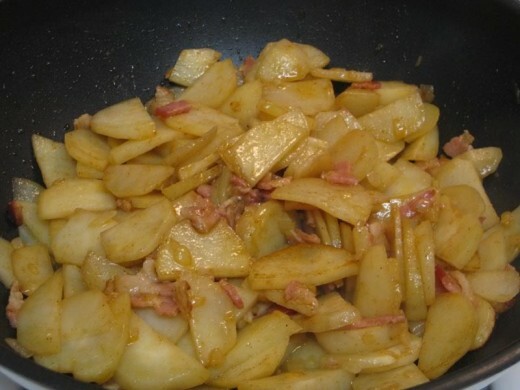 Let it cook over medium for about 10 or 15 minutes, or until the potatoes are soft, stirring often. Bratkartoffel Spice isn't easy to find outside of Germany, but you can easily make your own similar spice by mixing these ingredients: 1 Tbsp. Salt, 1 Tbsp. Paprika, 1 Tbsp. Pepper, 1 Tbsp. Nutmeg, 1 Tbsp. Garlic Powder, ½ Tbsp. Onion Powder, ½ Tbsp. Sugar. Leave a Note! - What do you think? Have you tried one of these recipes? Let us know! Super delicious, great pictures, amazing content. Made my mouth water. Thank you for this yummy lens. Absolutely love Potatoes. The spud is king and I love your recipe for home made potato crisps. I've made the potato slices like the one's you've done above, but I like the idea of combining Paprika and Chilli as I love spice. Yummy! Yummy! Great recipes. Long live the potato! Favourited these - lovely lens thanks. Can't wait to try some of these recipes, great job! I love potatoes and these recipes sound good. Nice pictures too. 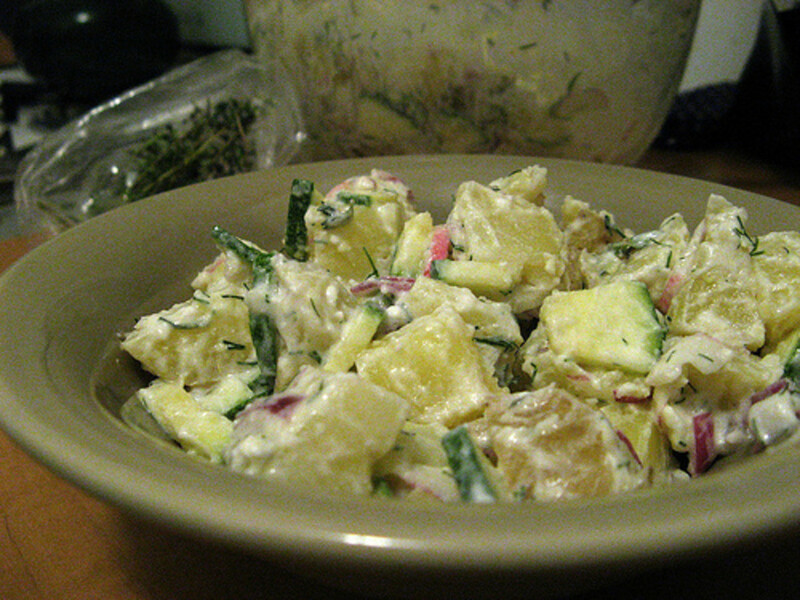 Potatoes are one of my favorite vegetables and will certainly try of few of those recipes. Welcome to the Culinary Favorites From A to Z group again! You'll find this lens under "P is for Potatoes." Don’t forget to come back and add your lens to the link list so that it will appear on the group page a second time! There aren't many foods as satisfying as the simple potato, are there? That bowlful of Roasted Potatoes With Carrots could not look more mouthwatering. Rolling this one to my food-related Laftovers lens. And thank you for stopping by my baby shower gift lens. 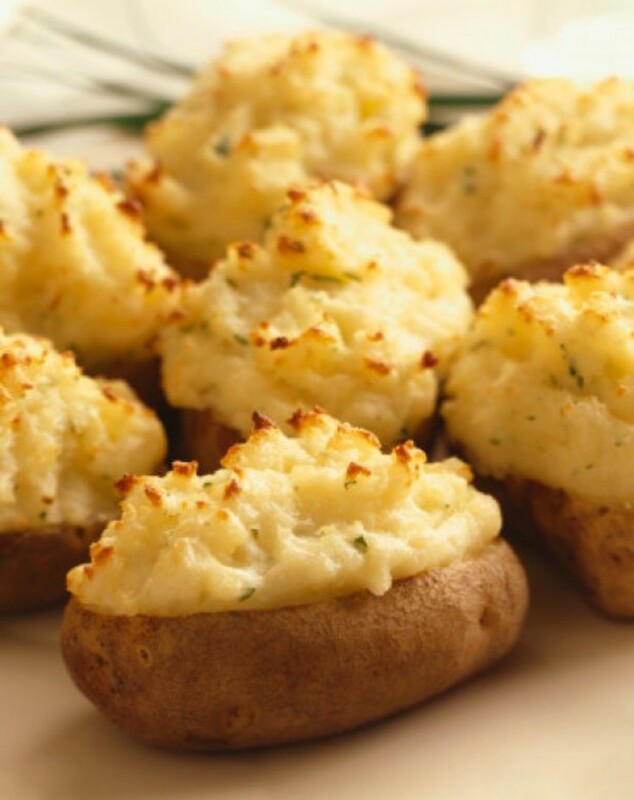 These potato recipes look great 5* and thanks for dropping by!